As the most used form of communication today, messaging has become the optimal channel to deliver rich content and value added services to subscribers. 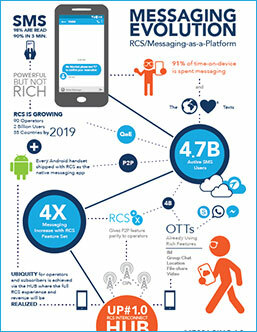 Interop Technologies' RCS Business Messaging Platform is a cloud-based messaging solution built using advanced Rich Communication Services (RCS) specifications from the GSMA Universal Profile (UP) to enable mobile operators to take full advantage of new service differentiation and messaging monetization opportunities. Built upon RCS standards and specifications, the Interop RCS Business Messaging Platform enables mobile operators to build new engagement opportunities with subscribers and capture new revenue from the business-to-consumer (B2C) messaging market. With RCS application-to-person (A2P) capabilities, subscribers gain direct access to brands they love, right from their devices native messaging. Complies with GSMA FNW.11 v.1.0. Reclaim Your Messaging Revenue Today!